Just when it seems the West End couldn’t get any glitzier, Drew McOnie’s glittery adaptation of Baz Luhrmann’s 1992 cult hit Strictly Ballroom transfers to London, leaving a trail of sequins in its wake. Following a smash hit premiere in Leeds, the vibrant new musical is currently storming the stage of the Piccadilly Theatre, and providing enough raucous fun to rival even the most popular West End stalwarts. Scott Hastings is an ace dancer with his sights set on the ballroom dancing big leagues. Unfortunately, a passion for inventing his own steps lands him in hot water, and his put upon dance partner Liz abandons him, leaving him solo just weeks before the Pan-Pacific Grand Prix competition. Enter Fran, a dorky wannabe dancer with frilly ankle socks and an almighty crush on the rebel golden boy at the dance studio she attends. Scott reluctantly partners with Fran and helps her to blossom into the master hoofer she dreams of being. But up her sleeves she’s got some surprise moves of her own! Simply put, Strictly Ballroom is irresistible. Choreographed to perfection by Drew McOnie, this is one musical where the dance aspect undoubtedly outshines all other facets of the production. Mastering the exhilarating moves, Zizi Strallen is an unparalleled leading lady, alongside the equally charming Jonny Labey. Undoubtedly, they've got to be top contenders for the West End's most charismatic on-stage couple. Strallen is as convincing as the klutzy beginner Fran as she is as the willowy star who emerges after weeks of rigorous training. Meanwhile, Labey brings lots of light and shade to Scott, the smug competitor, and as a result their joint journey gives the overblown story a surprisingly emotional heart. 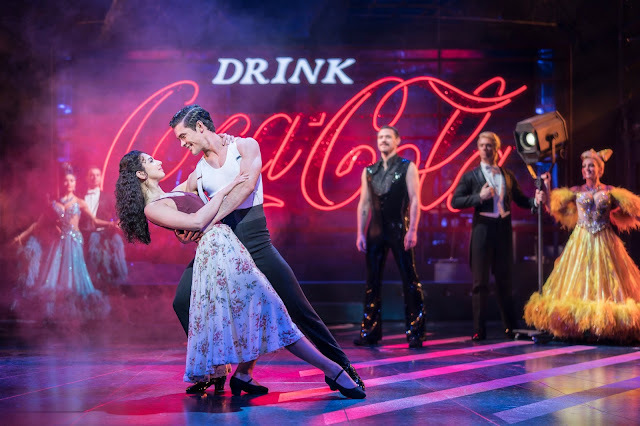 However, while the slick and impressive dancing and compelling leading duo keep the show looking glossy throughout, Strictly Ballroom is slightly let down by its use, or rather underuse, of music. The musical’s jukebox soundtrack is certainly fun, and played with verve by an extraordinarily zesty on-stage band whose relentless beats kept the energy on a nonstop high, but it all feels rather incidental, which is unusual for such a theatrical West End show. The songs of Strictly Ballroom are, for the very most part, performed by onetime Pop Idol winner Will Young, who has made a name for himself as a dependable musical theatre performer over the last few years. Here he plays extravagant commentator Wally Strand, a ballroom dance fanatic with energy to spare. He adds some extra humour to the proceedings, and sings up a storm, but despite this his presence feels a little shoehorned in. It would been nice to see Wally Strand take a more active role in the story, thus justifying his presence. In contrast, at one of the musical’s emotional high points, it is glorious to hear Fran and Scott finally sing out to each other in an expression of love, but sadly it’s a rather short lived moment which fades quickly. That being said, the whole production comes together so impeccably that its faults are easy to look past, especially when the musical is taken for what it is; a dazzling and hilarious bit of over-the-top fun! Sure, the dancing may be a spectacle on its own, but the whole production revels in glorious excess. With eye-popping costumes, overflowing with dreamily garish sparkle, decking out a bedazzling supporting cast, including Anna Francolini as Scott’s unyielding dance mom, Strictly Ballroom is a feel-good visual feast which will mesmerize audiences from start to finish. And yes, there’s even a confetti cannon to bring everything to a close!